When it comes to choosing the best gazebo for your backyard there are a lot of factors to consider. They can range from overall size and material selection, to build quality and price. 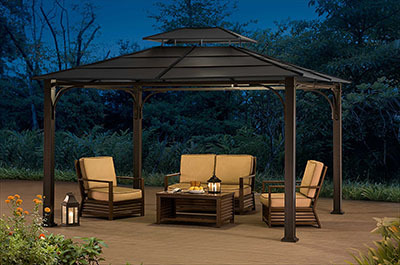 One of the most popular choices today, and for good reason, tend to be traditional hardtop gazebos. With their durable construction, stable design and fashionable looks they make a great addition to any backyard or patio. While buying a hardtop gazebo might seem to be an easy task, there is a lot more that goes into it than meets the eye. Throughout this guide we’ll be reviewing the best hardtop gazebos head to head. Covering all the top brands, features, styles, materials and more, so you can feel comfortable with your purchase and enjoy it for many seasons to come. We’ve put together the below table for quick reference so you can compare our top choices at a glace. Click here to learn more about our top choice or scroll down to read the full reviews. 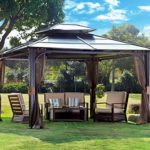 If you’re looking for an absolutely stunning, high quality hardtop gazebo that is packed with features, the Sojag Messina Hard Top Sun Shelter is an ideal choice. With a spacious 10’ x 12’ covered area, you’ll be able to fit even the largest pieces of outdoor furniture and still have room to spare. Not to mention the high ceiling height allows for more exotic fire pit tables and grills to be placed underneath for a truly incredible look. This gazebo is the perfect size for entertaining and your guests will be complimenting you for years to come. One of the great features we loved about the Sojag Messina was the included nylon mosquito netting. Made from very thick and durable fabric, it keeps even the nastiest of insects at bay. Mounted on a track system surrounding the gazebo, the netting can easily be moved to the side or detached completely. Even the second tier top vent has a custom fitted section of netting to ensure that no sneaky bugs enter in from that direction either. A feature like this is a must have in any areas with high bug populations or for people who’d rather not have a fly floating in their mojito. 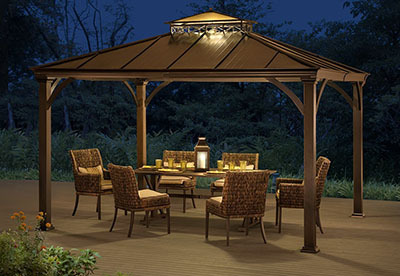 The overall design of the Messina hardtop gazebo is truly the work of excellent engineers. From the unique two-tiered vented steel roof configuration, to the elegant charcoal hue. There is almost nothing else we’d want to see in a gazebo. The roof panels are made from high quality coated steel that holds up to even the strongest of storms and extreme snow. In addition, the panels are routed to a mini-gutter along the edge to provide excellent rainwater protection and eliminate water dripping off in great sheets. The only real downside to this unit, if you can even call it that, is a bit of a long winded set up process. Even with two people you should expect a solid day of work to get it up and running. While the assembly is not particularly difficult it is time consuming with the 200+ pieces of hardwards and multi part assemblies. However, fear not, for there is an excellent instructional assembly video which guides you through each and every step. Plus, you should only need to assembly this once in order to enjoy it for decades to come. How stable is the Messina Hard Top in heavy winds? The unit has been tested in up to 85 mph winds and holds up perfectly. However, you need to ensure the gazebo is properly anchored. How tall are the columns? The columns stand right at 6’-5” tall. How long does it take to assemble? Around 6 – 12 hours with two people. Is the hardtop waterproof? Yes, the roof is completely waterproof. How does the unit stand up to snow loads? The gazebo is very well constructed and can take upwards of 2’ of snow, however we recommend you do periodically push the snow off the roof for safety. How is the unit anchored? There are three pre-drilled holes on each of the legs. Can this be installed on a deck? Absolutely, it can be anchored to wood or concrete. Does the gazebo have a gutter? Yes, there is a small gutter that drains rainwater down one of the legs. Can I put a fire table underneath it? Yes, there is a significant amount of clearance and no fire risk. While the Sojag Messina might be king of the castle, the Chatham Steel Hardtop Gazebo is not far behind. Similar to the above unit this hardtop gazebo offers a spacious 10’ x 12’ interior that provide ample room for entertainment throughout the entire year. 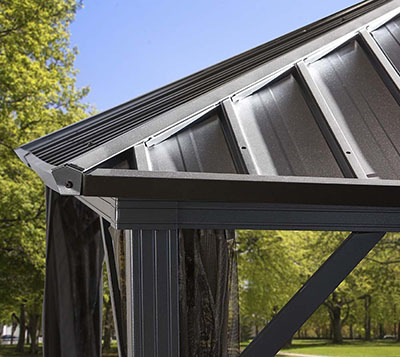 With a heavy duty aluminium frame design and durable steel roof, it can withstand even powerful wind gusts. When it comes to keeping the sun and rain off, it does an incredible job. During the height of summer you can feel the difference when you walk into the shade and if a surprise spring shower pops up you’ll still be in business. The Chatham Hardtop Gazebo also comes with included bug netting that wraps around the unit on a tracked system. It is easily positioned just the way you like it or quickly tied off to the posts for easy entry and exit. Because of the dual rail design you can also add a gazebo privacy panel for either extra rain protection or simply to close off the space and transform it into a awesome screened gazebo. 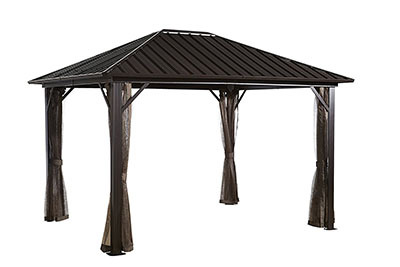 Similar to a few other units, the Sunjoy Chatham Gazebo offers a double tiered vented roof design which is configured to reduce trapped heat and vent any smoke from BBQ grills or fire tables. One of the things we did notice this unit lacked was a gutter system. We really hate having to run through a waterfall every time it lightly rains, but it’s a small drawback on an otherwise great hardtop gazebo. Assembly wise this unit took around 6-12 hours, but that was mainly due to lack of instructions. The provided booklet was very unclear and left a lot of things up to chance, things we ended up have to redo. It would have been nice if a video was provided for easy assembly tips and guidance. But in the end we were able to get it up and it does indeed look wonderful. One feature that we found very handy was the center ceiling mounted hook. This was great for hanging lights and decorations and really helps to give this unit a leg up on the competition. Is this hardtop gazebo designed for all season use? Yes, the Chatham gazebo can be used and outside all year round. What is the clearance for the roof? The lowest point of the roof hangs at 6’-7” tall. Can the roof panels be removed easily? The panels are meant to be kept in place and are not easily removed. Can this gazebo be used with a fire table? Yes, it works perfectly for this application. How much wind can this unit handle? Even in 60 MPH winds the gazebo remains solid. Does it come with mosquito netting? Yes. Sometimes you just want to have one of the biggest hardtop gazebos, but aren’t willing to pay the name brand price. That’s where the Sunjoy Hardtop Gazebo shines. Just like the other two before it, this is a standard 10’ x 12’ gazebo which offers plenty of extended outdoor space to make rainy or sunny days into more opportunities for outdoor happiness. One thing to keep in mind though is that this is a budget gazebo and as such the materials are not the same quality as the more expensive units. An example of this can be found in the thin steel roof panels. While they do a great job of keeping the sun and rain off. During heavy winds or hail they can become easily damaged unlike the heavier gauges steel of the more expensive units. We did like the classic two-tiered roof design that quickly dissipates summer heat and lets cool air circulate throughout the large metal gazebo. We were also impressed with how quick this gazebo kit was to put together. In around 6 hours with two people we had it up and were admiring our handywork over a good beer. Plus with the all metal design it’s is a snap to clean, just take a hose to it and it’ll look like new in no time. One of the major drawbacks in our book however, and the reason we’d recommend the more expensive Sunjoy and Sojag patio gazebos are the lack of rods to hang bug netting and privacy curtains. When it comes to quality products I expect them to have all the features I’d want and the exclusion of these two make this a difficult purchase for bug prone areas. However if you’re in an area that is relatively secluded and bug free, this might make for a great low cost alternative if you don’t need those features. Large, high quality 10’ x 12’ gazebo with a budget price tag. Low maintenance, easy to clean design. 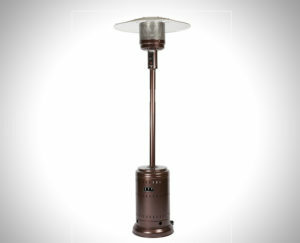 Does not have hanging rod system for mosquito or privacy screens. Does this unit come with mosquito netting or privacy screens? No, clip on varieties can be purchased separately. Can a grill or firepit be safely used underneath the gazebo? Yes, both can be used. Can this unit be anchored into concrete? Yes, there are holes to anchor it into wood or concrete. If you’re looking for an absolutely largest hardtop gazebo kit to usher in a new era of outdoor living, the Sojag Genova is up to the task. Spanning a massive 12’ x 16’ makes it one of the best gazebos for large gathering and parties. If you’re thinking of putting a hot tub under the gazebo and still want room for a few chairs and a small table, you’ll have no issues fitting them under the incredible hard canopy. Similar to the other Sojag gazebos, this is an extremely high quality piece of outdoor equipment and can stand up to extreme wind and rain. With durable steel roofing panels, a well constructed aluminium frame and a convenient center hook design, it has everything you’d need to create the perfect outdoor space. Visually the Sojag Genova is stunning. With a dark chocolate coloring, clean lines and a minimalist design philosophy there is a lot to love about this full sized gazebo. The rugged exterior coating can withstand years of continued use and weather exposure with little ill effects, something that is a must have for the focal point of your outdoor entertainment room. Plus the downward sloping roofing lines help to reduce snow load and make cleaning a snap, no more leaves or sticks sitting on your roof in great heaps. Another thing to note about the Sojag Genova is that if you’re looking for the same style but in a slightly smaller package, they also offer a 10’ x 12’ option. As with our other top choices, it comes standard with a dual track system for both the robust included bug netting as well as an optional privacy curtain for those nights when you just want a cozy retreat. One of the more notable features that is missing from this unit is the upper roof vent. However, during our testing we found that the larger canopy allowed for significantly more airflow than the smaller designs and did not require the vent to disperse extra heat or smoke. Another consideration to note is the lengthy assembly time for this unit. Being a large hardtop gazebo there are quite a few bits and pieces that need to be accounted for and installed. As such, you should budget at least two full days to assembly this with a minimum of one person assisting you. Some of the large roofing panels can be tricky to install solo and having a helper will make the task much safer as well. Large 12’ x 16’ covered area. Includes mosquito netting and dual track system for both it and privacy screening. Extremely durable four season construction. Thick rust proof galvanized steel roof that block all sunlight. Lightweight aluminum frame makes assembly a bit easier. Convenient central hook to hang lights or outdoor fans on. No central roof vent, but the unit is large enough to horizontally self circulate air. No gutters to direct rainwater away from the roof edges. Very complicated installation with poor directions, takes around 2 days of work to put up if you’re inexperienced. Can this be installed on a deck? Yes, there are three holes on each leg for mounting bolts. How many boxes does this gazebo ship in? Typically it ships in two separate boxes. How tall is the lowest point of the roof on this unit? The lowest point is 6’-5”. Can this gazebo kit be moved once set up? Yes, but only if it is not anchored. 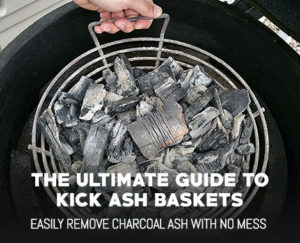 Can a propane fire pit be used under this? Yes, due to the all metal construction fire are perfectly fine. When it comes to hardtop gazebos, bigger isn’t always better, especially if space is at a premium. Enter the Sojag Dakota Sun Shelter, this compact 10’ x 10’ gazebo is perfect for smaller spaces and decks where you just want to eek out a tiny bit more outdoor living space. You can expect the same high quality steel and aluminium construction of the other Sojag offerings, so no need to worry about hail storms or raging winds. The galvanized coated steel roof does an excellent job protecting you and your guests from the elements and provides great shade on even the sunniest of days. The rugged exterior paint holds up to year after year of intense sunlight and summer storms with no damage to show for it. Another great plus for this outdoor gazebo is the stunning chocolate brown color and simplistic design choices, for a clean, no nonsense look. We tend to enjoy darker colors on outdoor equipment as they are able to easily hide stains or accidental dents much better than lighter colored options. Again we can’t forget to mention that the Sojag Dakota comes standard with the rugged bug netting and double track system so you can easily envelop yourself in a bug free cocoon of comfort. The durable bug netting has convenient vertical zippers for quick entry and exit so you don’t let any of the buzzing nasties in on accident and ruin your party. How much does this hardtop gazebo weigh? This unit weight right at 194 lbs. Are the roofing panels waterproof once installed? Yes, they are water tight one in place. Since this is a smaller unit, can I anchor it down with weights alone? We recommend you bolt this unit to a concrete or wood foundation and not rely on canopy weights. This stunning Sunjoy 2 Tier Hardtop Gazebo is an incredible sight and one of the most beautiful gazebos on the list. With elegant patterns, arching formed metal supports and an elegant polycarbonate top, soft light can trickle underneath bathing yours guests in a golden glow. The extra light creates a very inviting and welcoming space and really help to open up your exterior. 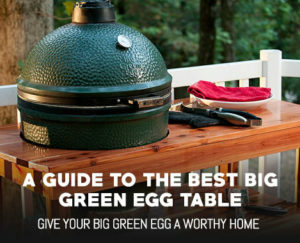 Not to mention, the size is perfect for spending summer afternoons grilling or hosting well heeled evening cocktail parties once the kids have gone to bed. The Sunjoy L-GZ401PCO-1D is a 10’ x 12’ gazebo enabling you to put chairs, fire pit table, and grills underneath it with room to spare. We can’t tell you how brilliant this unit looked with a crackling fire pit below a golden halo of light. If there was ever a gazebo that was to be described as a head turner, it’d be this one. We also spruced up the design by hanging a rustic lantern from the center and running string lights around the edge of the roof which really helped to make the gazebo pop in the late afternoon and evening hours. 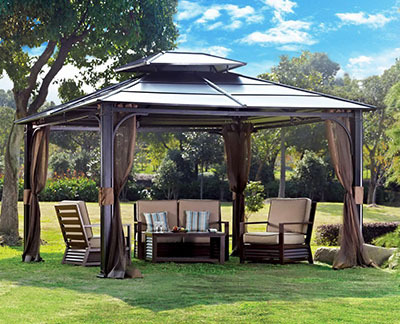 What makes this handsomely designed gazebo even better is the low price tag. Coming in at one of the lowest cost options on this list the Sunjoy makes for a great budget hardtop gazebo. The 120 sq. ft. size is perfect for both medium and large spaces. Yet, even with the low price, this unit is superbly built out of robust steel roofing panels and stable aluminium supports to provide a sense of safety and reliability. Couple the high quality construction with the rich brown roof and matte poles and this gazebo will stand out from the crowd. Nearly everyone who came and saw the unit thought it was incredible and admired the unique design. Extremely sturdy and heavy duty design, weighing in at 357 lbs. Can this be installed on a wooden deck? Yes this gazebo is built for wooden decks and concrete slabs. How does the unit hold up to snowfall. The Sunjoy makes for a great winter gazebo and is extremely resistant to snow loads. Does this gazebo come with mosquito netting? No, this does not come with mosquito netting, Sunjoy offers it sold separately. Are there pre-drilled mounting holes on the base? Yes, there are holes drilled in each of the leg flanges. Is there a rail for curtains? No, this gazebo does not support rail mounted privacy curtains. Does the top allow rain in during storms? No, the top is slanted in such a way as to prevent water leaking in. Does this gazebo come with concrete anchors? Yes, anchors are provided for concrete. What is the eave height of this gazebo? The eave height is 80”.